King of fighter's 1994 (officially abbreviated KOF '94) is a 1994 fighting game released by SNK for the Neo Geo arcade and home console. It is the inaugural game in The King of Fighters series by the same company. 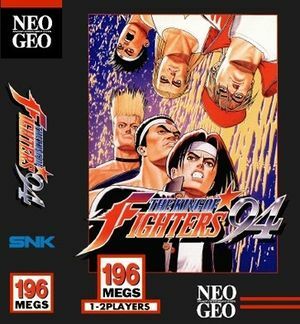 The game was originally ported to the Neo Geo AES and Neo-Geo CD following its original arcade release. The game is a fictional crossover featuring characters from SNK's previous fighting game properties Fatal Fury and Art of Fighting, as well as revised versions of characters from their pre-Neo Geo games Ikari Warriors and Psycho Soldier, and original characters created specifically for the game. The plot features the creation of a new King of Fighters tournament created by the criminal Rugal Bernstein, but this time with teams composed of three members unlike the ones from Fatal Fury, which had no teams. The graph below charts the compatibility with The King of Fighters '94 since Dolphin's 2.0 release, listing revisions only where a compatibility change occurred. 3.0-878 Windows XP AMD Athlon II x2 215 @ 3.56GHz NVIDIA GeForce GT 440 Working at 100% of speed. For better sound need to enable DSP LLE recompiler. †.fl.l). This page was last edited on 6 January 2018, at 11:47.